There are some people in my life right now who are tackling tough issues regarding their careers, their marriages, and their eating and exercise habits. They want to be fulfilled, happy, and healthy. 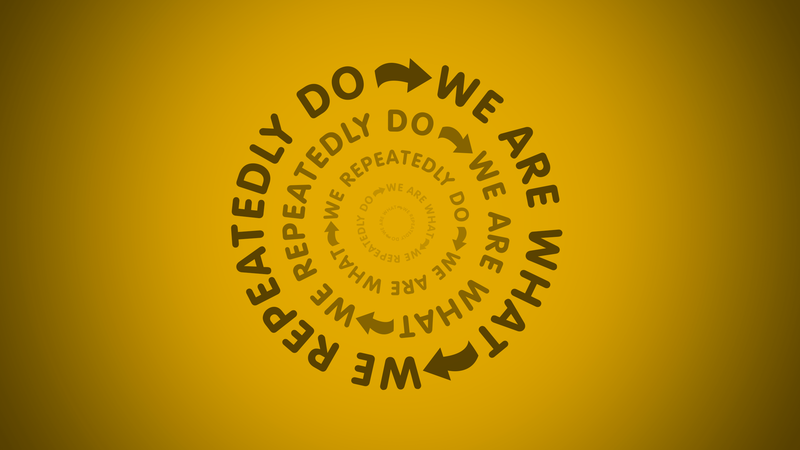 I read this today on Lifehacker: “We are what we repeatedly do. Excellence then, is not an act, but a habit.” Aristotle said this in so many words, apparently. Those people I mention? They require habits, as Aristotle suggests. Developing a good habit to find your excellence (your success, your content, your fitness) seems obvious, but obvious doesn’t mean easy. If repeated action yields a desired reality, what if the repeated right action requires a new level of energy or motivation or will, in order to replace whatever bad habit preceded it? A woman today described her 15-month old son. He had recently learned to climb up onto the furniture. And he would do it, over and over and over again. As if every time was the first time, expressing the same goofy grin, each and every time. Given this, and even though I’m in no way qualified, I’m going to try to qualify Aristotle. A habit is a series of individual acts. Maybe the trick is to teach ourselves to be like a toddler learning to climb. Nonstop. Undaunted. Happy with every attempt, with every individual success. Maybe we to need to act as if we haven’t already tried something before. Maybe we need to chuck our expected outcome of any action out the window. You know that saying, attributed to Albert Einstein, that insanity is doing the same thing over and over again and expecting different results? Maybe if you do the right thing, over and over again, and expect nothing but the joy of completing a single right act… You’ll be better able to repeat that act.